This recipe was so easy to prepare! After browning the onions and beef the only thing I had to do was open and dump cans and packages. And as easy as it was, it tasted great! I highly recommend trying this soup if you like tacos or chili. 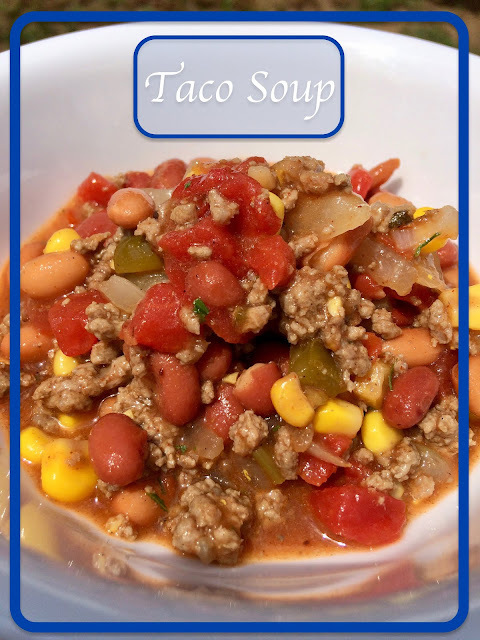 In fact, I think Taco Chili would be a more apt name, as it is hardly soupy. The only negative feedback I got on this one was that it was a little spicy. My husband is not a spice fan. He did say, though, that the flavor, including the aftertaste, was very nice. I thought the flavor profile was perfect, but if you want to tone down the spice factor, swap out the chili beans and just use your favorite unseasoned bean instead. Original Recipe can be found on page 33: 100 Favorite Weight Watchers Recipes. Brown beef and onion. Drain fat. Add remaining ingredients and heat through.